Q76. Would you say that the best way to travel is in a tour group led by a guide? Argument: I would have to agree that the best way to travel is in a tour group led by a guide. Support 1: When I travel to a new country, I do not know the language and it can be very difficult to navigate. 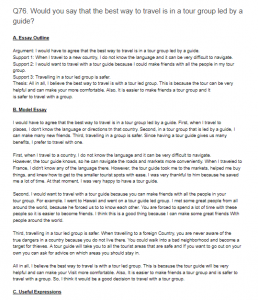 Support 2: I would want to travel with a tour guide because I could make friends with all the people in my tour group. Support 3: Travelling in a tour led group is safer. Thesis: All in all, I believe the best way to travel is with a tour led group. This is because the tour can be very helpful and can make your more comfortable. Also, It is easier to make friends a tour group and It is safer to travel with a group. I would have to agree that the best way to travel is in a tour group led by a guide. First, when I travel to places, I don’t know the language or directions tn that country. Second, in a tour group that is led by a guide, I can make many new friends. Third, travelling in a group is safer. Since having a tour guide gives us many benefits, I prefer to travel with one. First, when I travel to a country, I do not know the language and it can be very difficult to navigate. However, the tour guide knows, so he can navigate the roads and markets more conveniently. When I traveled to France, I didn’t know any of the language there. However, the tour guide took me to the markets, helped me buy things, and knew how to get to the smaller tourist spots with ease. I was very thankful to him because he saved me a lot of time. At that moment, I was very happy to have a tour guide. Second, I would want to travel with a tour guide because you can make friends with all the people in your tour group. For example. I went to Hawaii and went on a tour guide led group. I met some great people from all around the world, because he forced us to to know each other. You are forced to spend a lot of time with these people so it is easier to become friends. I think this is a good thing because I can make some great friends With people around the world. Third, travelling in a tour led group is safer. When travelling to a foreign Country, you are never aware of the true dangers in a country because you do not live there. You could walk into a bad neighborhood and become a target for thieves. A tour guide will take you to all the tourist areas that are safe and If you want to go out on your own you can ask for advice on which areas you should stay in. All in all, I believe the best way to travel is with a tour led group. This is because the tour guide will be very helpful and can make your Visit more comfortable. Also, It is easier to make friends a tour group and is safer to travel with a group. So, I think it would be a good decision to travel with a tour group.